Can Culleretes restaurant Barcelona. Barcelona's oldest restaurant. 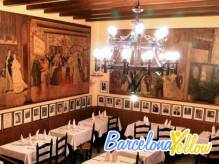 Generations of Catalans have eaten at Can Cullertes which was founded in 1786 and is in The Guinness Book of Records as being the oldest restaurant in Barcelona and the second oldest in Spain. Can Culleretes has a well deserved reputation for good traditional Catalan food served in authentic surroundings and with quality service. The menu has over 40 dishes including typical Catalan food like escudella (traditional soup), botifarra amb seques (pork sausage with beans), civet de porc senglar (stewed wild boar), perdiu a la caçadora (stewed partridge), canelons d'espinacs amb brandada de bacallà (spinaches and cod cream cannelloni), pastís de rovellons (rovellon mushroom mousse) and more. Famous desserts are Vanilla-hearted Chocolate Dome, Tart Tatin with vanilla ice cream, Trianon Chocolate Cake with coconut ice cream, Cheesecake with strawberry, Biscuit vanilla ice cream with hot chocolate, Profiterols with hot chocolate, Bavarois with strawberry or pineapple and many other homemade fresh desserts, sorbets and ice creams. Can Culleretes is in the Gothic District of Barcelona, next to Las Rambles, Plaça Reial and Plaça Sant Jaume. Groups welcome. Reservations accepted and recommended. Culleretes means spoons in Catalan. Can Culleretes started as a bakery serving sweets and desserts in 1786 and later evolved into a tradtional restaurants. There are two versions of how the restaurants came to be named Restaurant Spoons. The first is that when they began to use metal spoons for desserts they did not have enough spoons and the waiters would also go up to the counter and ask the girls behind it for more spoons. Another less likely explanation is that Can Culleretes was the first restaurant in Barcelona to start using metal spoons instead of wooden spoons. Can Culleretes is divided into four rooms and each has a fantastic modernist interior. The walls are covered with huge paintings and hundreds of signed photographs framing memories since the beginnings of Can Culleretes.